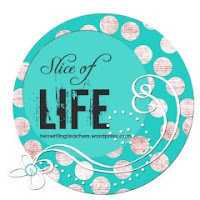 The weekly Slice of Life is hosted by the writing teachers at twowritingteachers.wordpress.com. Everyone is welcome to participate through posting or commenting! Yesterday, I attended a workshop given by Kate Roberts, our district's staff developer. Mel wrote about Kate's new book here that Kate co-authored with Christopher Lehman, Falling in Love With Close Reading. Since the book came out just last week, it was especially exciting to host Kate and get to see her work with teachers and students in our district. I had even more fun with this when I brought the idea of close reading song lyrics home to our dinner table. My 15 year-old, who is usually in a hurry to get back to her homework, sat and co-analyzed American Pie, pulling out her phone (usually prohibited at the dinner table) to show us a website that she knows of that had annotated and researched all of the lines of American Pie. I have to admit that, even though I know all the words to that song, I knew very little about its meaning until last night. My father has dementia and rarely participates in dinner conversations, but he loved this activity and he knew all about the Buddy Holly references. "February made him shiver," my dad said, then went on to explain the reference to newspapers. Our entire dinner table (last night there were seven of us) lingered and sang Grenade and American Pie. Outsiders would have definitely wondered about the song choices! Loved last night and love the idea of close reading with songs. Jen Vincent and Kellee Moye cohost It's Monday! What Are You Reading weekly on their blogs. 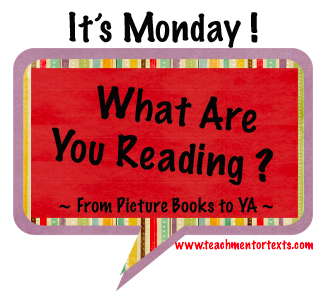 To see what others are reading and recommending each Monday, or to participate, be sure to check out their blogs Teach Mentor Texts and Unleashing Readers. 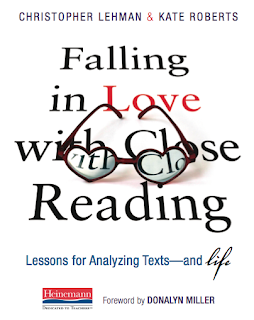 Professionally, I read Falling in Love with Close Reading by Christopher Lehman and Kate Roberts this weekend. 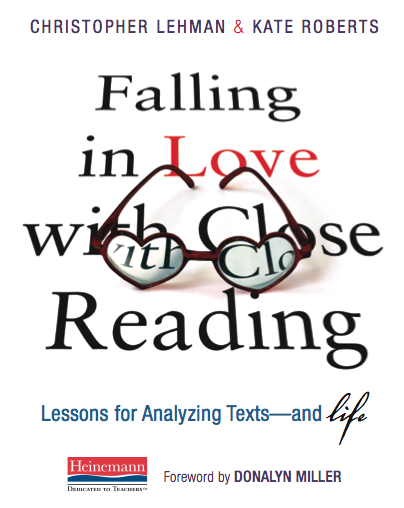 This is a must read professional book if you want to learn more about close reading and how you can teach your students to independently use close reading skills/strategies. This book includes examples of student work, lessons, thinking prompts, charts, and more to help us teach students how to read closely for text evidence, word choice, structure, point of view/argument, and to compare across texts. Each chapter also has a section at the end that explains how the skills are directly connected to the CCSS. We are extremely fortunate to have Kate Roberts as our staff developer in our school district and are very lucky to have her coming today for professional development on close reading with our 6th grade teachers! So stay tuned to hear about that PD soon! If you don't already follow Kate and Chris on Twitter or follow their blogs (Kate and Maggie's blog - Indent and Christopher Lehman's blog), I highly recommend that you begin to follow them. Thank you Chris and Kate for writing this professional book and sharing your ideas, lessons, and passion for close reading with all of us! 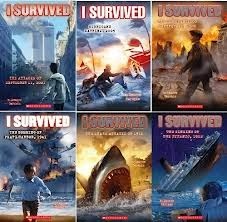 The I Survived series by Lauren Tarshis is a very popular series in my classroom this year and every year! I have read parts of the books, but did not read the whole series until this week and I now understand why they are always so popular and why I keep buying multiple copies of each one! I love how each book begins right in the moment of the terrifying event and then flashes back to tell the boy's story of what was happening right before the historical event took place. This predictable structure helps readers navigate through the text and know which part of the story is flashback vs. flash-forward. I love how Lauren integrates a fictionalized boy's story with true information about the historical event in each book. I also love how she includes a section of factual information in the back of each book to give the reader detailed facts about the event. This series is engaging for all readers, but especially for reluctant readers who like action packed and thrilling stories to read! Studying the writing standards of the Common Core State Standards, I have come to believe that students must be active and engaged in their learning and transfer previously learned skills in order to meet their expectations. Therefore, as we transition from one writing genre to another, students should understand the shift and be able to explain the similarities between one type of writing and another. When I met with one of the district's newer teachers to unpack the personal essay unit that follows the personal narrative one, we envisioned and designed the following chart to be created with students. I think that if I were teaching this lesson, I would complete the left side of the chart as an inquiry lesson, expecting that students could tell me the components of narrative writing, since they have just completed that unit. Then, I would explicitly teach the right side of the chart and have the chart to refer to throughout the personal essay/opinion unit. As with the other chart, I would develop this chart in front of students and I would use the examples that they'd provide from their own personal narratives. I'm always interested in hearing about how other people are teaching or seeing students transferring their learning, so as always, I invite you to share! 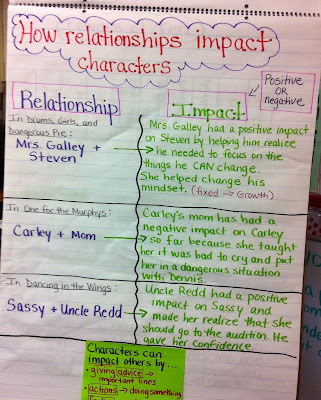 What Impacts our Characters? What Impacts People? 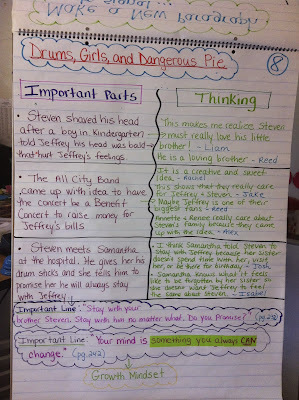 Each year, in fifth grade, we teach a character unit in reading workshop and I love it because it really teaches students how to grow ideas about their characters. In the past, I usually only taught two mini-lessons on character impact and how events and secondary characters impact the main character. 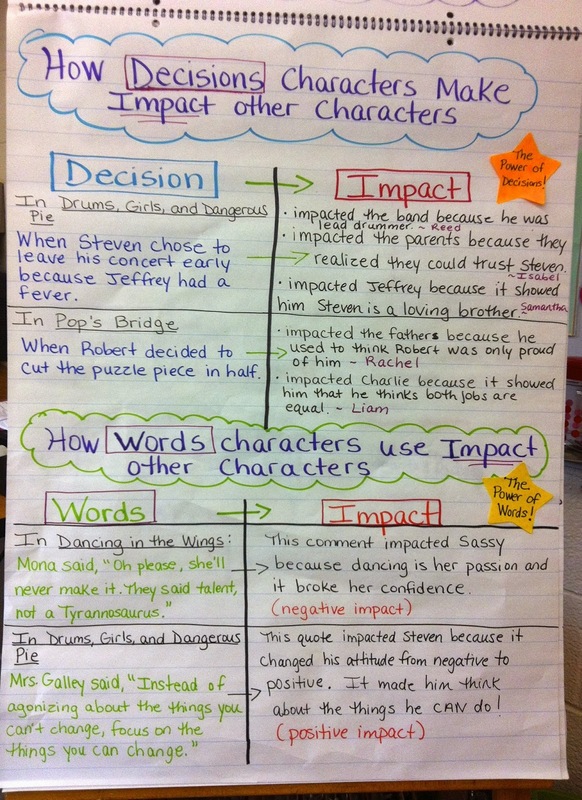 This year, I chose to teach four different mini-lessons and focused on: How Events Impact Characters; How Decisions Impact Characters; How Words Impact Characters; and How Relationships Impact Characters (see charts below that were created in each mini-lesson). This instructional decision had a positive impact on my students as readers and lifted the level of their thinking and understanding for how many different factors impact our characters and cause them to act or feel a certain way. After teaching these mini-lessons on character impact, I pushed my students' thinking even further and had them think about how we can apply these same lessons to our lives. Since we have been talking a lot about fixed mindset, growth mindset, and respectful language in our classroom this year, the students immediately made the connection to how events, words, decisions, and people impact us in positive or negative ways. This led to a powerful conversation about the power of words and actions and how someone else's words and actions can impact us. 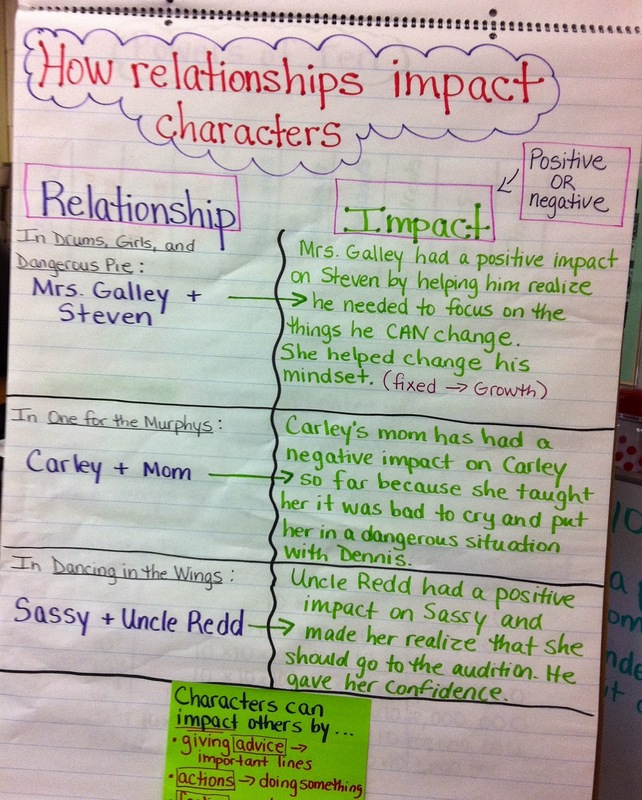 The time spent teaching this string of mini-lessons on character impact was powerful and lifted the level of thinking in my students as readers, learners, and individuals! Jen Vincent and Kellee Moye cohost It's Monday! What Are You Reading weekly on their blogs. To see what others are reading and recommending each Monday, or to participate, be sure to check out their blogs Teach Mentor Texts and Unleashing Readers. Some of my very best reading recommendations come from this pathway! The long weekend offered some good reading time. I read a few picture books and some professional ones, as well. Fireflies by Julia Brinkloe is an oldie but goodie. This book is one of the featured fourth-grade tradebooks in the new Units of Study from Teachers College. What a wonderful book for teaching personal narrative! There are so many opportunities in this book to explore craft--there's beautiful imagery: "Blinking on, blinking off, dipping low, soaring high above my head, making patterns in the dark"; subtle character development: "And as quietly as I could, so she wouldn't catch me dulling them, I poked holes in the top of the jar with Momma's scissors. "; And showing, not telling: "I tried to swallow, but something in my throat would not go down." Really, really great mentor for all writers--I can understand why TC chose it! 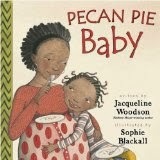 Another book that is a part of the fourth-grade tradebooks pack is Pecan Pie Baby by Jacqueline Woodson. While the story line is not a small moment, it does have a tight focus of a big sister-to-be's struggle with the impending rival of a new baby. This story is a tremendous resource for teaching about voice. Just the subtle difference of using "that" instead of "the" when referring to the baby gives the narrator a strong voice that readers hear loud and clear. Continuing with the pack is Fox by Margaret Wild. Fox is a tremendous story of friendship, loyalty, trust, and betrayal. Told from the perspective of an injured magpie, this book could lead to some serious conversations about how loneliness can lead to evil behavior. As a writing mentor, there are tremendous examples of powerful verbs and varied sentence structure--"Fox scorches through woodlands, through dusty plains, through salt pans, and out into the hot red desert. He stops, scarcely panting. There is silence between them. Neither moves, neither speaks." Wow, I'm impressed all over again as I re-read these sentences. I've saved one of my new favorite books for last and I thank Carrie Gelsen for the recommendation of The Man With the Violin by Kathy Stinson. I can not quote it because I could not keep this book to myself and it is in the hands of one of my colleagues for the weekend. However, it is a beautiful book about noticing, appreciating, and celebrating unexpected beauty in the world. I think that we will all hear more about this one. I am going to share my reading of Georgia Heard's Finding the Heart of Nonfiction in a post all to itself. It's that good. Really. Last Tuesday, I wrote my slice of life post about our visit from Teachers College Staff Developer Christine Holley. Over the course of the year, we have several days when one of our three Staff Developers come and work with teachers within our schools, usually within our classrooms. I love these days, as they are always full of new learning and inspiring ideas for curriculum and instruction. Use dramatic play a lot. Ask kids to show us what it looks like. 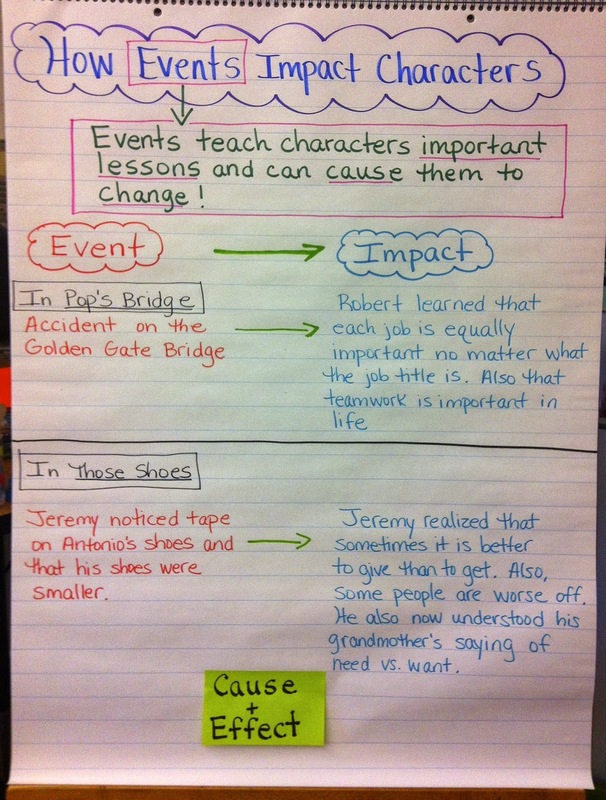 Have students give re-tells, using the text. Model rereading, trying out new ideas. Amanda played with different ideas for headings and the students were all so engaged and with her on this! Encourage students to keep the author in mind. What does the author want us to learn? What's the message that the author is trying to tell us? As we watched Amanda teach the lesson, we were all impressed by how much time she spent on so few pages. Isn't is amazing how much there is to teach kids??? All of the videos are such gifts to the reading and writing teachers of the world. They are categorized by teaching points and types of writing to make it easier to find your mentor lessons. That being said, they are all worth watching! I have written quite a few posts about the concept of having a Growth Mindset vs. Fixed Mindset and being inspired by Carol Dweck's book, Mindset and Peter Johnston's book, Opening Minds. Click here to read posts I have written about the concept and my learning/new thinking from reading their books. This year, I decided to start the year off with talking about the concept of having a growth mindset with my students and not waiting. 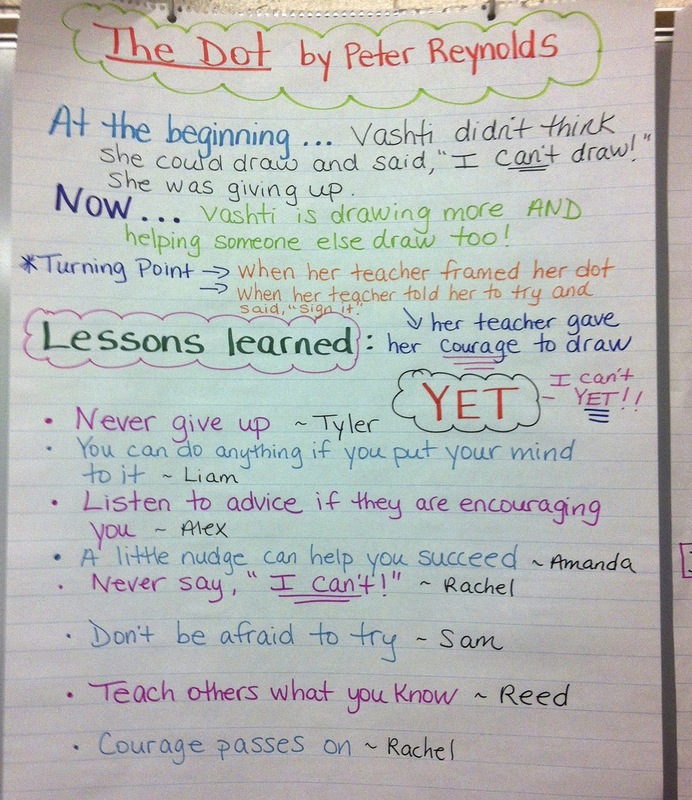 Just like last year, I read The Dot by Peter Reynolds on the second day of school and began talking about the power of the word YET and how we should use that word as learners when describing something we can't do YET instead of just saying, "I can't do this, it is too hard." This book opens the doors to a powerful conversation about what having a growth mindset means. See our class chart below that we created while reading aloud The Dot and what students had to contribute about the word YET and having perseverance instead of giving up on trying. 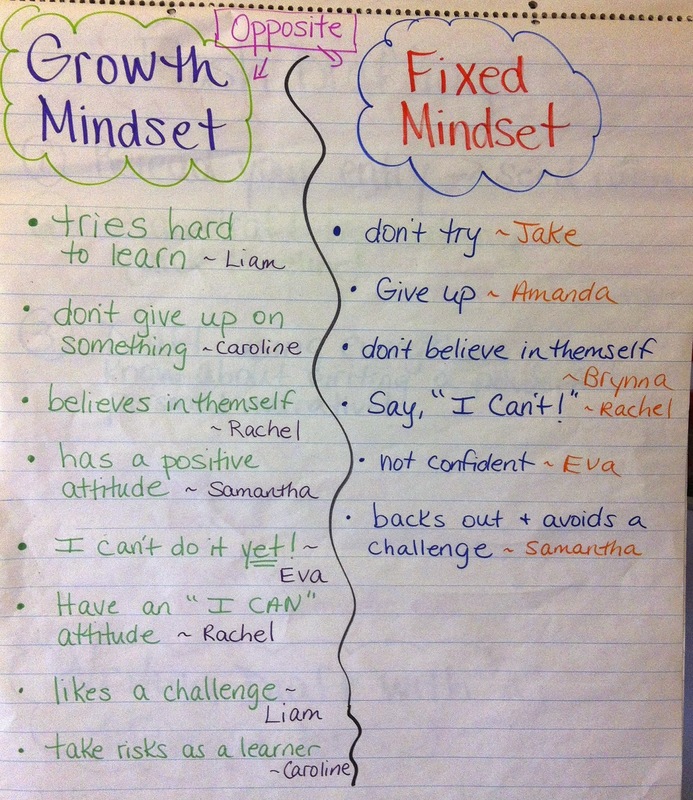 After a few days of talking about the difference between having a growth mindset vs. a fixed mindset, we created this class t-chart to visually compare the two mindsets and how they are opposites. 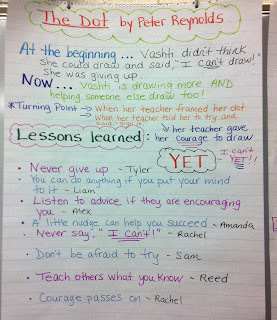 Students contributed their thinking about the two mindsets and also what a person with that kind of mindset might say. 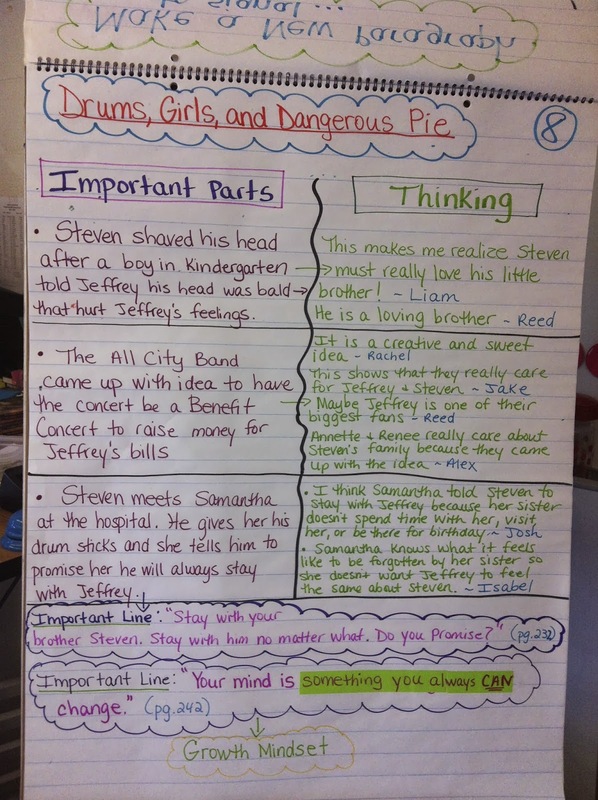 While reading Drums, Girls, and Dangerous Pie by Jordan Sonnenblick as our first chapter book read aloud in September, we came across this important line: "Your mind is something you always can change." This line immediately reminded the students of growth mindset so they wanted to add it to our Growth Mindset vs. 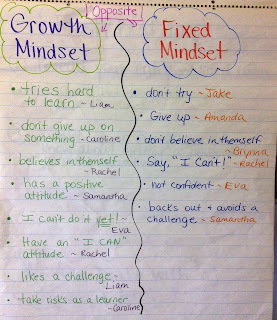 Fixed Mindset chart so we created a new one below that includes the important line. I am noticing that students are referring to growth mindset and fixed mindset during partner conversations about their characters as well as during turn and talks during our read alouds. They are internalizing these important concepts early in the year as learners and I am seeing students persevere while trying to have a growth mindset themselves. I will continue to have conversations with students about this concept and have students reflect throughout the year about their own mindsets as well as the mindsets of characters. If you have not read Mindset by Carol Dweck or Opening Minds by Peter Johnston, I highly recommend that you add them to the top of your stack to read. I read these books for the first time a over a year ago and they have impacted my teaching and learning in multiple ways! The team at twowritingteachers.wordpress.com hosts the Slice of Life on Tuesdays. Everyone is welcome to post and comment! My sixth-grade daughter knows that she can get my full attention whenever she shares excerpts from her writer's notebook. This afternoon, she asked if she could read me her beginning as we were driving home from school. Tonight, I found her notebook next to my computer, so I am sharing her beginning with all of you. "Let's go swimming," my sister says. The sun is shining brightly and the sun rays make the crystal blue water shimmer. The wind makes the trees sway back and forth like saying hi. The flowers burst with color happy for it to be summer again. The dogs get let out and sniff around the garden and chase each other around. Today was the day I was going to jump off the diving board without any help. I jump into the pool and then I arise and walk up the steps and that is when I take my first shaky steps toward my enemy but I know today I am going to defeat my enemy--the diving board. I silently debated, then wondered a little more out loud. "What if you had a line in there that went something like 'it was funny that everything was so beautiful that it seemed weird that this was a day of doom for me?'" (I admit it--I'm teaching the writing here and not the writer...) "Mom," Cecily said, "this description has nothing to do with the story. I'm just using my elaboration techniques." Sigh. I'll keep working on the relevance factor--but I do enjoy her voice! I love all of Wendy Mass' books and couldn't believe that I never read The Candymakers! It came to my attention a few weeks ago, when I was giving book talks to my class for the book nominees for the 2014 CT Nutmeg Book Award. 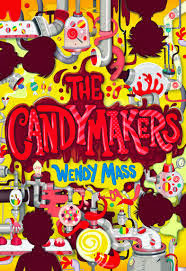 The Candymakers by Wendy Mass is one of the intermediate nominees. I couldn't believe I hadn't read this book yet and had multiple copies in my classroom. I immediately took one of the books home to read and enjoy this weekend and I loved it! I love how this book has similarities to Charlie and the Chocolate Factory (one of my favorite childhood movies!) and how the parts of the book are told by the four contestants' perspectives so the reader hears their point of view on the events. I also love how some of the contestants are connected in unpredictable ways and how the connections are revealed to the reader. This book is full of humor, mystery, suspense, friendship, and heartwarming moments too! Enjoy! Opinion Writing about the Periodic Table...Who Knew? 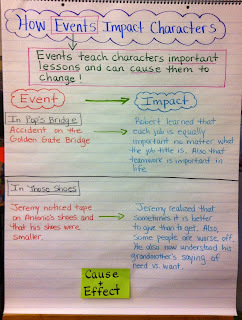 This year, we have integrated writing instruction into the content areas in sixth grade. We structured this by thinking in terms of three. Three grading periods, three content areas, and three types of writing. Next week, I will be working with science teachers about how they will weave opinion writing into their unit on matter, elements, mixtures and compounds. Because I did not initially see the connections between the periodic table and writing editorials, I called a few of my chemistry-oriented friends on Friday afternoon, then spent some time researching their ideas to see if there would be enough information. "What are some debatable topics that are within intellectual reach of eleven year-olds?" I asked them. If anyone reading this has other ideas, please, please share them, but here are some of the ones that we came up with. I am also including some of the resources and articles that I found to go with them so that we can develop text sets. Please feel free to use these, but also feel free to share additional resources that you might have! Fluoride and whether it belongs in public water. I also collected a few articles about what sorts of materials physicians and dentists should use for joint replacements and dental fillings, but I am still processing about whether these are debatable topics. I need to call a couple of my doctor friends. Perhaps the most insightful call was with a friend who has her doctorate in a field related to sustainable living. She has just eliminated her lawn in favor of pachysandra and suggested debating the pros and cons of lawns--she ran off several reasons to make me think about ground covers other than grass. She also suggested researching about composting, fracking, and fertilizers. Until yesterday, I knew nothing about fracking. What a hugely debatable topic that is! As we continue our path along integration, I'd love to hear other experiences, and again, my plea is out for debatable topics that relate to elements and compounds. On Tuesdays, Stacey at twowritingteachers.wordpress hosts the Slice of Life. Feel free to participate either by slicing yourself, or reading and commenting on some of the great posts that are linked up to her blog. I always feel lucky when we have one of our Teachers College Staff Developers come and work with teachers in our district. Yesterday and today, Christine Holley is working with our primary teachers. Because she stays in a hotel close to where I live, I give her rides to and from our schools. She thinks that I'm doing her a favor, but it's really me who gets the perk because I love to listen to any and all of her thinking about literacy and the work that they are doing at the Reading and Writing Project. Inspire young children to notice the world around them. When they notice closely, they have things to write about. Wonder with children and teach them the language of wondering to use orally and to use in their writing. I wonder...I notice...could it be...maybe...what if...are all such important sentence starters to push children to think more about the world that we share. Model the joy of sharing our thinking and recording our thoughts whenever possible. Teach children to talk to each other. Speaking and listening are in the CCSS, but, more than that, speaking and listening are critical life skills for developing relationships. Help children develop strategies to have their writing become more and more readable, not only to other people, but also--especially also---to themselves! In the afternoon, Christine worked with kindergarten teachers about close reading. "How are we planning our read alouds and our shared reading with proper turn and talks so that we can have kids asking what part of the texts made you say that?" she asked. My favorite line of the day, though, was "the only reason we read is to find meaning." Love that. What other reason is there to read? As I sift through my notes from yesterday's afternoon session, there will be more to come, but for now, that's enough.